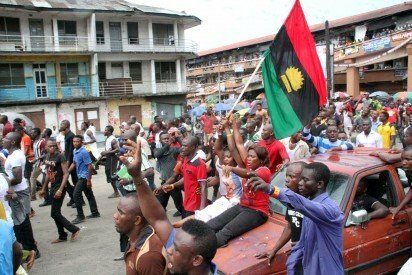 Indigenous People of Biafra, IPOB, had described as political compensation, the kite being flown by some Northern elders to the effect that Ndigbo would be allowed to produce the president in 2019. Spokesman of the IPOB, Emma Powerful, yesterday, on the issue, said, they were not interested in Nigeria’s affairs any longer, adding that those flying the kite of Igbo presidency in 2019 were merely a distraction. On his part, Powerful said, what IPOB wants was the release their leader, Nnamdi Kanu from detention and to allow Biafrans to go and not to play politics of compensation by telling Ndigbo that they will become the president in 2019, apparently to douse tension. He recalled that politics of compensation was played during the June 12, 1993 saga when the Yoruba were compensated with Olusegun Obasanjo presidency in place of M.K.O. Abiola’s annulled election, just as President Buhari was compensated because of Boko Haram insurgency. According to him: “If politics of compensation was used to favour Obasanjo in place of June 12 annulment and was also used to favour Buhari in place insurgency, that is their own cup of tea. But for us in IPOB, we are not interested in that politics of compensation whereby we are being told that an Igboman will become Nigeria’s president in 2019 and we will begin to listen to them. “All we want or are interested in is the release our leader, Kanu and then allow Biafra to be and not Igbo presidency,” he added.